If you love beer, you’re in the right place. Today is National Beer Day (like anyone needs a reason to celebrate beer)! National Beer Day commemorates April 7, 1933, the day that the Cullen-Harrison Act was enacted. This allowed for the legal sale of low-alcohol beer in the United States, several months before Prohibition was completely repealed. And thank goodness! As he signed the law into legislation, President Roosevelt said, "I think this would be a good time for a beer." Well, Mr. President...we agree. 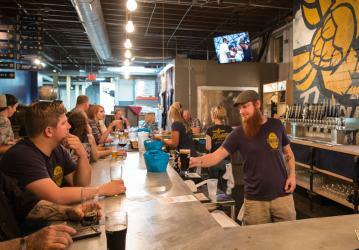 It’s no secret that this region is foaming with craft beer. But the fact that the nation has a day specific to honoring beer made us think… are we doing enough in this region to honor our beer heritage? We did some digging and here are a few of the ways we celebrate beer. Holler Festival – an introduction to the people we know who love making great craft beer and spirits. 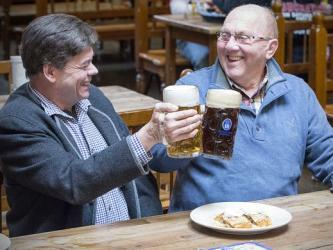 MainStrausse Village Oktoberfest – a celebration of life with great German and American food, drink and entertainment. Newport Bacon, Bourbon and Brew – festival dedicated to the area’s rich history and connections to the brewing and pork industries as well as our region’s long ties to the bourbon industry. 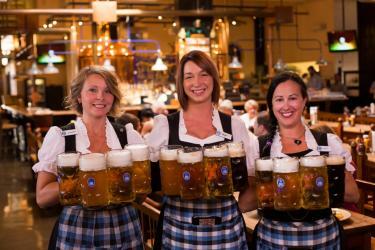 Hofbrauhaus – Um... every day is Beer Day at Hofbrauhaus! Yes, beer is celebrated in this region in many ways. Check out more about regional beers, watch the video, and let us know your favorites in the comments below.